Moritz Grossmann formulated the ideal of “designing a simple but mechanically perfect watch” in the 19th century. With the ATUM ‘Schaffo’, the functionality and beauty of the mechanism are apparent at first sight. 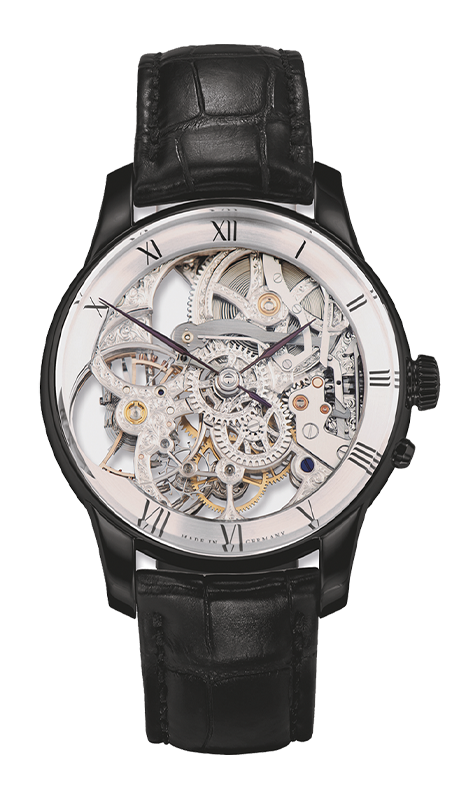 The dial consists of an elegant, narrow ribbon of rhodium-plated German silver featuring the minute markers, revealing the exquisitely finished movement, where each component has been chamfered, chased and engraved by hand. 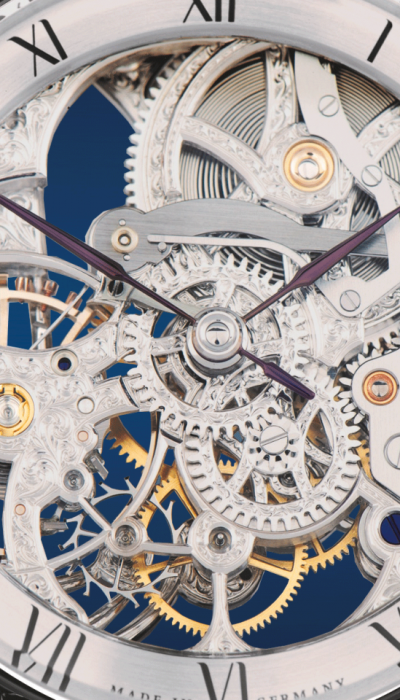 Every movement of the dial train, balance wheel and other parts of the mechanism demonstrates the artistry and technique that went into making this timepiece. Blackened stainless steel is used for the case, winding crown and pusher which — along with the black alligator leather strap — form a stunning contrast to the dial. Schaffo’s artistic creativity, technique and craftsmanship are outstanding and renowned around the world. He painstakingly stamped, cut and milled to minimise the material used for the calibre 100.5 in the ATUM ‘Schaffo’. The result is a masterpiece of skeletonisation. The Moritz Grossmann brand manufactures timepieces to the highest standard of craftsmanship under the tagline “Schönstes deutsches Handwerk”. The ATUM ‘Schaffo’ brings together the craftsmanship of two masters — the Swiss artist Christophe Schaffo and the German watchmaking pioneer Moritz Grossmann. The one-off watch includes the name C. Schaffo on the ratched wheel and is a single edition 1 of 1.